After my son, Ryan, died two months ago, I kept moving forward with work --- in disbelief, in sadness, but buoyed by the love that poured over me from all quarters of my life. It was possible to work slowly in the studio, and I was able to measure, cut, paste up, print, and generally accomplish things. There is a notion, translated roughly from the German, of "grief bacon," a slowness, a layering of emotion much like hibernation that comforts, nourishes, and protects those who have experienced loss. I had the grief bacon. Still do. The action that brought me pleasure and peace was knitting, to no knitter's surprise, and I wanted to make something for Heidi, Ryan's young daughter. At Red Purl in downtown Niles, my choice was immediate, soft, and white: yarn that Amy had spun from local sheep. Delicious between my fingers and heaven to my eyes, it invited another yarn to ride along -- something perfectly named Little Flowers. The bright bits strung along the fiber remind me of Tibetan prayer flags. So I knit my heart and my healing, my love for Ryan and his life, for his children, for all children into this rhythm of white and pink and red and sparkle. I love this post. Your imagery is so beautiful. I know Heidi will treasure this piece. Is it a sweater, dress what? 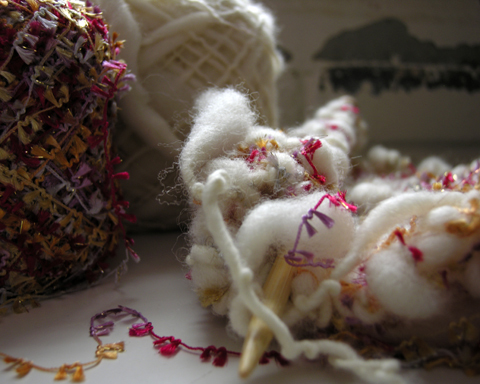 I think that repetitive motion of knitting and purling like the soft clunk of prayer beads over and over, trying to knit time back together. It will be a scarf. The girl is too fast-growing for anything that would fit her! And yes, time back and time forward, while in the present. A tall order, but a good one to fill. As always Eugenie, you paint with words like no one else. Stated in terms I so agree. Rhythm. The repetition is soothing and keeping ones hands busy is a near necessity as an artist. Loss takes on so many shapes and colors that stand alone. Soon they merge and blend as healing continues. Patricia, you describe so well the slow, curving process that takes us into ourselves and outward again. Thank you. My thoughts are with you in this grief process. I simply cannot imagine losing a child. My best friend died suddenly 5 months ago and it has been an incredible journey - hard to fathom and so so difficult at times. You are right, Kirsten -- it can't really be imagined, even now. I try to believe that he is not "lost," which is every mother's bad dream from the first time she momentarily loses sight of her child at the playground. My good friend, Carole Buschmann, advised me to be on the lookout for Ryan's spirit all around me. And that is good counsel. Thank you for your kind thoughts and beautiful work. My sympathy goes to you in your own sadness.